The war of words between Scott Weiland and his (former?) bandmates in Stone Temple Pilots heated up on Monday (June 3), when Weiland filed a multi-million lawsuit against STP, claiming that, despite their disagreements over the years, without him there is no STP. The suit, filed on Friday in Los Angeles, names STP members Deal and Robert DeLeo and Eric Kretz as the defendants, accusing them of, among other things, breach of contract and fiduciary duties. It comes after the remaining members of the group recently sued Weiland over claims that he sabotaged a planned 20th anniversary tour in favor of his own solo outing celebrating the band's first two albums. 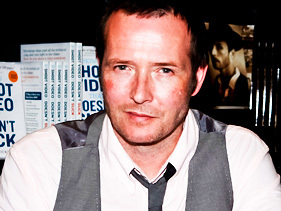 "How do you expel a man from a band that he started, named, sang every lead on every song, wrote the lyrics, and was the face of for twenty years, and then try to grab the name and goodwill for yourselves," read Weiland's legal action. "You don't, but three of the instrumentalists from the band 'Stone Temple Pilots' tried ... Without Weiland, the band ceases to be the same musical group that millions of fans recognize and love." The lawsuit continues the argument that Weiland began on May 24 when he penned an open letter to fans expressing his shock and disappointment that the remaining trio carried on without him, recorded a song and recently performed with a new lead singer, Linkin Park's Chester Bennington. "The band that played last weekend was not Stone Temple Pilots and it was wrong of them to present themselves as that," he wrote at the time. Weiland's suit claims that the other members recently met on band-related business without including him, "clandestinely conspired to wrongfully expel Weiland from the band and seize for themselves the valuable 'Stone Temple Pilots' name and associated goodwill. But such scheme failed: Weiland is still a member of the band, notwithstanding the other member's statement or actions to the contrary." Though they'd survived the previous disagreements about performing together, the suit claims that in 2012 the other members conspired to kick Weiland out of the band in order to seize the crown jewel of their contested partnership: the STP name and goodwill. The suit also claims that they tried to get him to sign an amendment to the original agreement that was "detrimental and inflammatory" to him and that they froze him out until he signed it. Among the claims in the Weiland suit are breach of contract, for which he is seeking $5 million, as well as breach of fiduciary duty and a violation of the Lanham Act (which covers trademark infringement and false advertising), for which he is seeking at least another $2 million. He also is asking that as long as he is not the lead singer, the band be dissolved under the STP banner. A spokesperson for STP could not be reached for comment at press time.